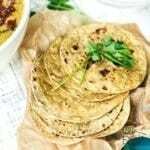 Simple and quick chapati (roti – round flat bread) recipe enhanced with use of avocados. Avocados are not easily available in India, hence this very heart health ingredient is seldom used in Indian recipes. Avocados are loaded with heart healthy fats, which are good for controlling bad cholesterol. In this recipe mashed avocados are added to the flour during the kneading process. 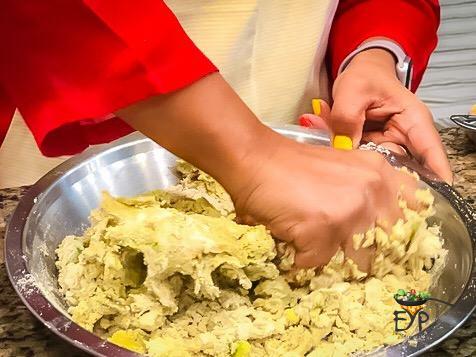 In this manner, rotis get a unique avocado flavor and all the fat from avocado make them super soft. So this is a great way to add avocados to your family’s daily diet without any extra effort. 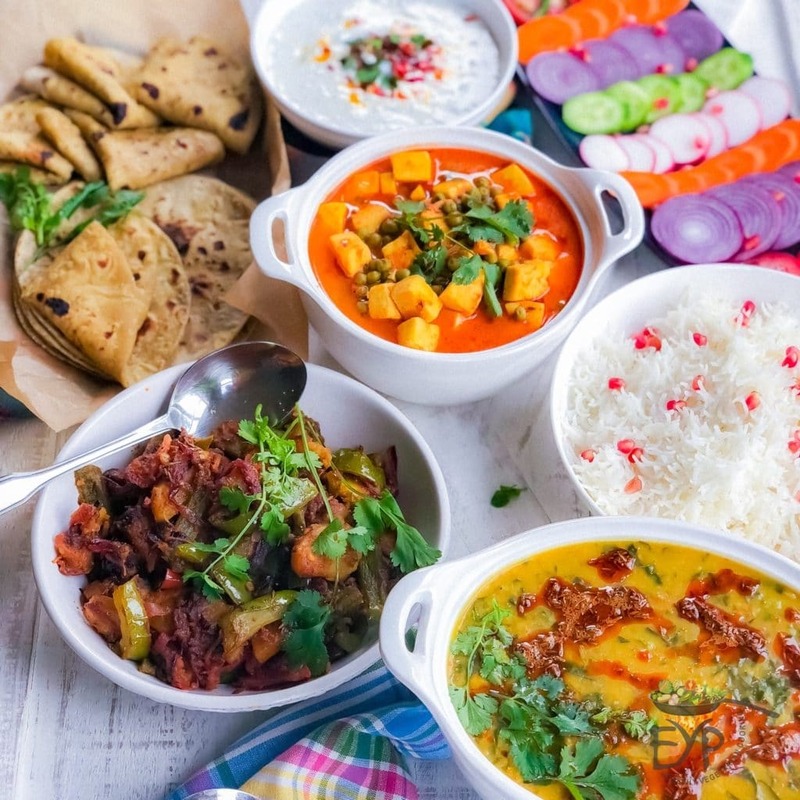 This recipe is used as part of Family Meal Ideas – Quick Indian Dinner Recipes. Place 2 cup flour in a medium bowl. Smashed avocado and salt in flour. Starting mixing the avocado mixture with the flour. Gradually start adding continue to knead till the dough comes together as a ball. Once all the flour is all together, knead it for 5-7 minutes using your knuckles or until smooth. 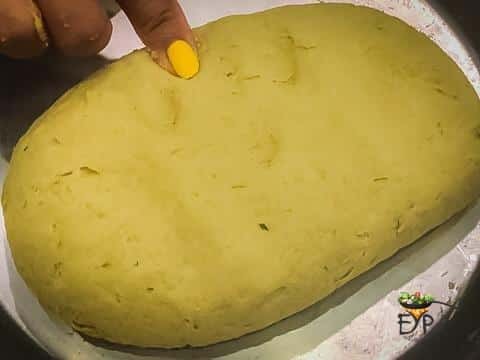 Make sure that dough is soft enough not stiff, that it leaves an impression when you press your finger against the dough. When you are ready to grill, start by preheating your cast iron skillet or grilled over a medium heat. While skillet is getting heat up, meanwhile divide the dough in equal size balls. I was able to get 10 balls out of it. Take one ball, flatten it between your palms, and dust lightly in dry flour. Roll out the dough ball using rolling-pin to 5-6″ in diameter, dust more dry flour if needed. Turn the heat of the griddle up to medium-high. Dust off the excess flour from the rolled roti/chapati before placing on the skillet. This will only take a few seconds. Flip the chapati using a pair of tongs. 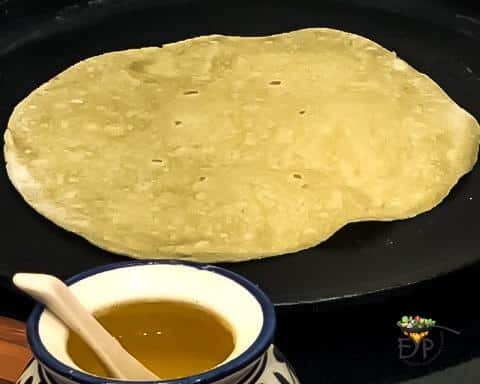 Press the sides and center of the chapati down on the griddle using a paper towel or cheesecloth, if you continue to cook on skillet only. This will help to puff up the roti. 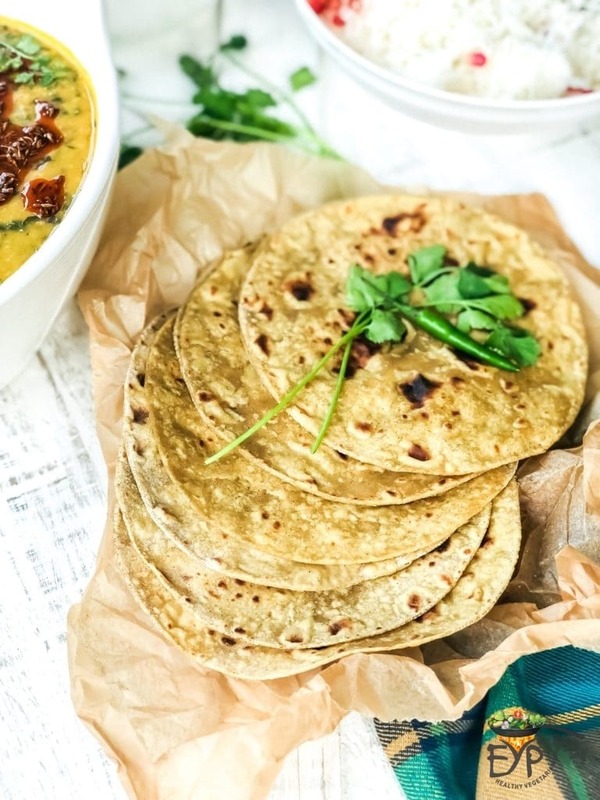 Once the second side is brown, remove the chapati from the heat and place it on a perforated surface like cooling rack or a mesh to avoid the sogginess from the steam. Immediately brush the top side with melted ghee. Repeat the process with remaining dough balls. NOTE: If you happen to have gas coking range then you can finish puffing it up on open flame. Set the skillet aside and using tongs cook the chapati on an open flame. Once the chapati puffs up, flip to cook on the other side. Take the chapati off the flame and brush the top side with ghee. Let me know how you like it? Please leave a feedback and/or rating. Roti or Chapati means thin flat bread, mostly made out of wheat flour. Avocado's add moisture, softness and good fats in the roti. Roll out the dough ball using rolling pin to 5-6″ in diameter, dust more dry flour if needed. If you happen to have gas coking range then you can finish puffing it up on open flame. Set the skillet aside and using tongs cook the chapati on an open flame. Once the chapati puffs up, flip to cook on the other side. Take the chapati off the flame and brush the top side with ghee.